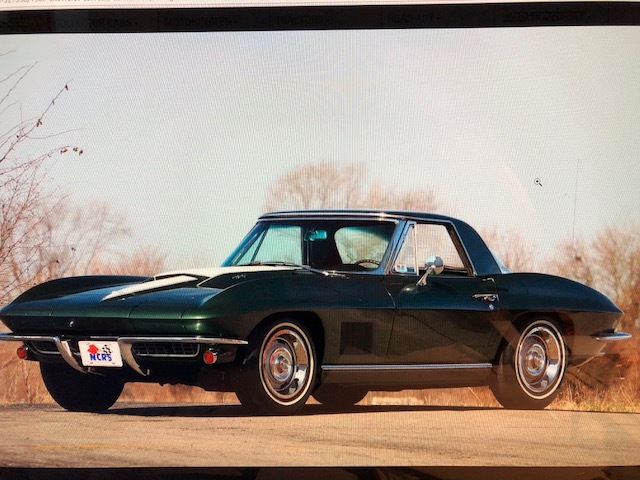 The 2018 Mecum Indianapolis Car Auction scheduled for May15-20 will feature dozens of pristine Chevrolet Corvettes including this 1967 green and white NCRS Regional Top Flight winner with its original 427/435 HP Tri-Power engine. The 2019 Corvette ZR1 is the official Pace Car for the 2018 Indianapolis 500 on Sunday, May 27 for the 102nd running of the legendary race. The 2018 Mecum Indianapolis Car Auction is scheduled just before the big race on May 15-20, and it will feature a dazzling display of collector Chevrolet Corvettes to help fans get ready for the big event. This 1967 classic Chevrolet Corvette is one of nine pristine Corvettes that will be going up for auction. The Mecum brochure describes this big-engined beauty as one of the stars of the event. “This NCRS Top Flight-winning 1967 Chevrolet Corvette Convertible is among the rarest of the breed. Produced on January 20, 1967, and purchased new from Harp Chevrolet, Inc., in Staunton, Virginia, it was factory-equipped with the vaunted L71 427 CI Tri-Power big-block V-8 engine, and it was carefully maintained in its original as-delivered condition by its second owner of 37 years from 1968 until 2005. In 2008 it underwent an extensive body-off restoration; its frame remains rust-free and the no-hit body retains the original bonding strips.” This rare, fully restored 1967 Corvette is expected to sell for up to $200,000. The other classic Corvettes, including two more 1967 beauties and a 1963 split-window are expected to fetch a little less. There are also two 1960 Corvettes that are expected to draw top dollar, as well as three from the 1950’s. This year will be the 15th time that a Chevrolet Corvette serves as the pace car for the Indy 500. Because of that Mecum is also offering a once-in-a-life time set of Chevrolet Corvette Pace Car editions for sale. The vehicles comes from the private collection of Keith Busse, a well-known businessman in Fort Wayne, Indiana. Busse has collected Corvettes for decades. This set is especially rare because many of these pace car editions were never sold to the general public. The grouping features at least one example from every year that a Corvette paced the Indianapolis 500 dating back to the first time in 1978. Examples of the pace cars are stored at the Indianapolis 500 museum and also at GM’s Heritage Center, in the Detroit area. Busse’s assemblage stands as the only complete set of Corvette pace car editions in private hands, and the opportunity it presents to bidders in Indianapolis is incredibly rare. The collection will first be offered together as one complete set, however, if an acceptable offer of purchase is not received, each car will then be offered individually without reserve. These are just some of the hundreds of vehicles that will be auctioned in Indianapolis, May 15-20, 2018. For more information check out Mecum.com.